My 11 page contraction lesson contains interactive pages, links to website activities and a student worksheet. 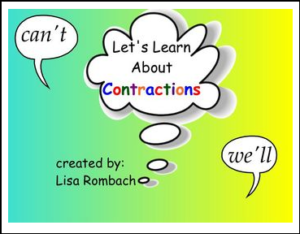 You students will have fun learning how contractions are made from 2 words playing some on-line interactive games. They’ll use pull tabs and “click and reveal” to read 2 words and the matching contraction. Sing along with a contraction song/video link and play a matching game. Finally, a worksheet is included to check for understanding.